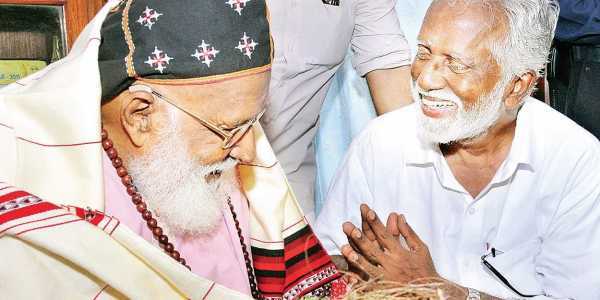 Diorama Governor Kummanam Rajasekharan visited Valiya Metropolitan of Mar Thoma Church Philipose Mar Chrysostom at Maramon Retreat Centre in Kozhenchery on Saturday, New Indian Express reported. Hailing the Governor’s visit, Mar Chrysostom told Kummanam that it was a privilege. Kummanam invited Mar Chrysostom to visit Mizoram as the chief guest at Independence Day celebrations on August 15. The Valiya Metropolitan said he would favourably consider the request. When asked about learning Mizo, Kummanam said he had already learnt how to welcome a guest in the local language and promised to learn to speak to locals in their mother tongue soon. The Governor said that Mizoram ranked second only to Kerala in literacy rate and he had no difficulty in conversing with local people in English. He said he would convene a meeting to enable students from Mizoram to study in professional colleges in Kerala. Kummanam honoured the Valiya Metropolitan with a handmade shawl brought from Mizoram. Kummanam also visited the tribal settlement at Attathode near Nilackal, where he felicitated Ayyappan, the 70-year-old head of the tribal colony, by offering a handmade shawl. He also presented gifts such as caps and blankets to the elderly people of the tribal colony. Kummanam visited the children of Aranmula Balasramam, which he had founded. He offered worship at the Aranmula Lord Parthasarathi temple.